Little, Brown Books for Young Readers, 9780316053181, 48pp. 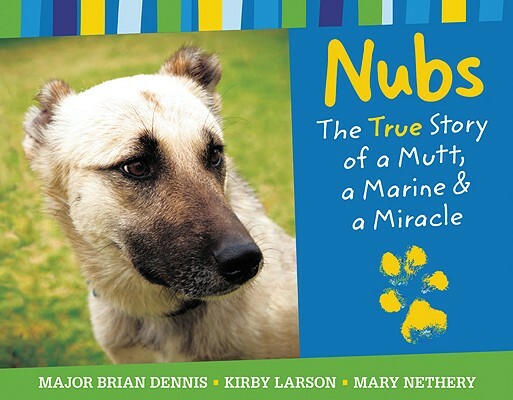 Nubs and Dennis will remind readers that friendship has the power to cross deserts, continents, and even species. Brian Dennis is the major in the Marines. He and Nubs live in San Diego. Kirby Larson is the acclaimed author of the 2007 Newbery Honor book, Hattie Big Sky. Her most recent title is Two Bobbies: A True Story of Hurricane Katrina, Friendship and Survival, co-written with Mary Nethery. Kirby lives in Kenmore, Washington. Mary Nethery is the author of many picture books, including Hannah and Jack, Mary Veronica's Egg, and Orange Cat Goes to Market. Mary lives in Eureka, California.